Published on August 31, 2017 in Business and India. 0 Comments Tags: CII, CTP, HYSEA, MCEME, Starbucks. Today , I read about a commitment by Starbucks to hire military veterans and their family members publicly stated as a branding exercise !. 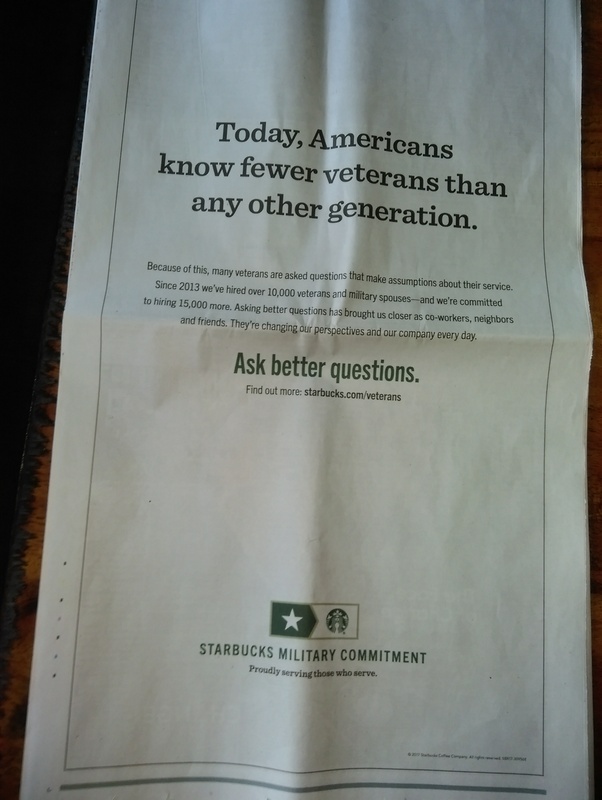 What a noble way of recognizing the contributions made by the Armed Forces of USA ! . 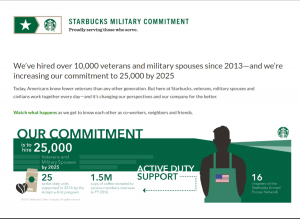 I am also aware that the US Government and the Industry gives utmost priority to employ Military Veterans in Civilian jobs after their engagement with the Forces. In the UK , there is a Govt sponsored Career Transition Partnership [CTP ] to connect military veterans with the Civil Industry. Leadership and Teamwork skills , Character , Structure and Discipline , Expertise , Decision skills in a dynamic high risk environment , Proven success and Loyalty . Back home in India , in spite of a full fledged Resettlement Directorate functioning with the Ministry of Defense , and various appeals made from time to time , only a very small percentage of the Armed Forces veterans who retire at a comparatively younger age get a second career in the civil . Of late , there are many isolated initiatives by many agencies to conduct training programs and orientation programs but these are yet to create an impact because of the lack of willingness of the Corporate World to come out with a process to enable this. There is also no stated policy or commitment from the Government to facilitate this transition. The general public and the Corporate World know only about the primary role of the Armed Forces – defending the nation against any external aggression. Therefore , the only skills that they generally attribute to the military officers and soldiers is in the domain of security jobs and at times general administration. In today’s hi -tech and most complex military environment , the men [ and now women ] in arms , possess very high degree of expertise in many fields of technology and engineering which can be gainfully utilized by the corporate organizations. In addition, the excellent managerial and people skills of the officers who have been tested in high pressure situations with an ability to taking responsibility for their actions and getting things done first time , can be exploited by the society at large . They are quick to learn , picking up new skills and can adapt to new circumstances with ease. I had read a paper on this titled ‘ Share our Brain Ware ‘ in the first Army – Industry partnership seminar organized by the CII [ Confederation of Indian Industry ] at New Delhi in 1995 while I was serving as a Dean of the Management Training Wing at the Military College of Electronics and Mechanical Engineering at Secunderabad . It was well received by the participants and some follow up action was initiated to get the details of skills and expertise from the Army sources for dissemination to CII member organizations. We also had successful Army / Navy / Air Force Officers who made a mark at Chairman / MD of public sector undertakings and other large organizations addressing the gathering. A degree in engineering , my exposure to the discipline of management through various courses in premier Army institutions , a MBA from the Indore University obtained while in Army Service , my 3 year tenure as an Assistant Military Secretary at the Personnel Branch at the Army HQ dealing with career planning and placement of senior officers in command appointments and my tenures as Managing Director of an Army Base Repair facility manned mainly civilians who are governed by the factories act , followed by my tenure as Dean at the MCEME . I had a successful civil career spanning 10 years with the IT Industry , working with a global IT Company as Head of Operations and later as Corporate Head for Knowledge and Learning for their Indian Arm. I also worked for another 10 years as the Executive Director of HYSEA – Hyderabad Software Enterprises Association [www.hysea.in] , the only state level association in India for IT Companies . I am not an exception – there are many more such profiles in the Armed Forces – with Army , Navy and the Air Force looking for a suitable break with the Industry . A few years back , the Indian Institutes of Management came out with a 6 months training program especially packaged for the officers of the Armed Forces . This was a welcome step but I remember many of those who qualified in those program , reaching out to me at Hyderabad for referring them to someone known to me. Therefore , there is a dire need to institutionalize this transition and I am sure the corporate world will benefit immensely from the well honed skills of the Military Veterans and at the same time fulfill a societal obligation they have to the nation. I sincerely hope the noble example I quoted in the beginning from the US will motivate the Indian Industry to take note and come forward to address this issue . Published on August 25, 2017 in Business and Leadership. 0 Comments Tags: Biocon, HYSEA, Kiran Majumdar Shaw, NRN, UIDAI, Vishal Sikka. Nandan Nilekani is back with Infosys after a gap of 10 years , this time on a SOS call from the co-founders and the board to release the bellwether IT Company from the recent controversies it got mired into , initially with the strong criticism on the board’s functioning by Narayana Murthy [NRN] , the co-founder of Infosys in 1981 with a shoe string budget , followed by the resignation of Vishal Sikka , the first CEO from outside , selected by the board unanimously in 2014 to re-position the company to meet the market challenges posed by the competition and technology necessitating a new business model . Sikka delivered in 3 years and took the company to a better standing among its competitors but his style of functioning and the tacit support he received from the board [ now without any founders as its members ] was not received kindly by NRN . The ” fight ” went out to the market and the Organization suffered in its standing in the public eye. The stake holders including the clients in 45 countries with a market cap of more than $ 34 billion and the co-founders who own 12.8 % of the shares could ill afford this situation and immediately did a rescue act by recalling Nandan to take charge and steer the ship to safety , balance and future prosperity. I have been closely following Infosys , at least from the late 90’s when they established their facility at Hyderabad . I believe , the then Andhra Pradesh Govt had to have several meetings with NRN to persuade him to open a branch at Hyderabad . I had an informal meeting with Chandrasekhar Kakal ,the first center head nominated for Hyderabad in my office with Metamor at the Cyber Towers when he came over to check with me on the availability of a temporary office for Infosys. He finally managed to get a few seats with the STPI [ Software Technology Parks of India ] facility in Cyber Towers on rent . Today , Infosys has two major world class facilities in Hyderabad employing more than 30,000 professionals and is a dominant player in the Telangana IT Eco System. As the Executive Director of HYSEA [www.hysea.in ] I had close interaction with Infosys , Hyderabad and all the Center heads from Kakal , Narry , Ravi Kumar , and Manisha has been members of the Managing Committee of HYSEA [ www.hysea.in] I met Nandan Nilekani during 2005 over a break fast meeting with HYSEA’s Managing Committee and was greatly impressed by his professionalism and a ” no nonsense ” approach to anything in business and life. Nandan has been largely responsible in taking NRN ‘s legacy forward when he stepped into his shoes as CEO of Infosys . The culture , value system , corporate governance , and impeccable credentials of Infosys is well known in the Industry. He later on became the public face of the Company and took it to greater heights and profits making it a truly global entity. It is therefore proper for all concerned to bring him back in this moment of crisis to do the balancing act and chart its future with a new board . I heard his press briefing today thanks to an on line coverage by Economic Times , and was very happy to listen to his deliberate and measured words to the media at the same time stating his immediate priorities candidly. He started by saying he is back because there is no one else , partly joking but otherwise meaning every word of it !. He assured that he represented 100 % of all the stake holders and has a ” clean slate ” to work on ,assisted by a newly constituted board and the second rung of leaders in the company. His tasks are to build consensus , bring in stability , find a new CEO from among the insiders/ outside / Infosys alumni who moved out in the past to other organizations with the help of a search committee under Kiran Majumdar Shaw , CEO of Biocon , and work with clients , institutional investors co-founders and all others in this endeavor . He specifically mentioned the need to ” patch up ” with NRN , the industry icon whose concerns needed to be addressed on priority. Nandan Nilekani joined Infosys first at the age of 26 in 1981 , was its CEO during 2002 -07 , continued as its Co- Chairman till he left to take up his job with the Govt of India , heading the UIDAI project , another path breaking performance which earned him great accolades from all. He is back with Infosys at the age of 62 to stabilize the company using his consultative skills as its HCF or LCD as he jokingly stated to the media today. Having read all his books , starting from the seminal work ” Imagining India ” and observed him and his style of Leadership from a distance , I am very confident that this new task is really cut out for him and he along with his team will bring this very resilient global company to greater heights and glory very soon. As he himself stated today , this is also one form of serving the nation , while answering a question from the media. Time to Re-Imagine Infosys , Nandan . Published on August 14, 2017 in Leadership. 2 Comments Tags: HYSEA, KTR, TCS. I consider it a great privilege in my corporate life to have met Padma Bhushan Dr F C Kohli, the founder CEO of Tata Consulting Services [ TCS] on 30 Nov 2016, when HYSEA [ Hyderabad Software Enterprises Association] felicitated Dr Kohli for his Life Time Achievement in the service to the IT Industry in India , during its silver jubilee event at the International Convention Center, Hyderabad. As the Executive Director of HYSEA at that time, I was deeply touched by the passion and indomitable spirit and above all his great humility when I spoke to him on phone after sending him a formal invitation sometime in September 2016 through Mr V Rajanna, the Vice President and Regional Head of TCS at Hyderabad. Mr Kohli graciously accepted our invitation, spoke to me at length asking me about HYSEA and the event. Thereafter, he read out to me major points he would like to cover in his speech and sought my views on that. Coming from a person of his stature, this was a new experience for me. When I joined the IT Industry with a MNC company back in 1997, Dr Kohli was already a great celebrity in the IT Industry of India. In fact, he is regarded as the ‘Father of the IT Industry in India’, having been the founder CEO of TCS way back in 1969. He was asked by the Chairman of TATA Group to take over the new entity when they decided to hive of an existing department to be a full fledged IT company. Under Dr Kohli’s leadership, TCS pioneered the IT revolution in India and the spectacular growth of TCS to what it is today is due to the visionary leadership and a ‘no nonsense” approach to his role by Dr Kohli. Dr Kohli not only led TCS to glory but used Information Technology for the masses in India. His various adult literacy programs using computer and his advocacy to engineering students to undertake research and come out with socially relevant programs and innovations shows his great commitment to Nation Building. 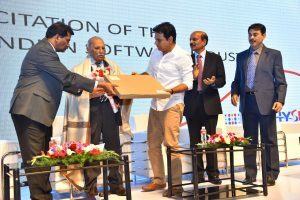 In his speech during the felicitation ceremony, he exhorted the IT Industry Champions to design software in all Indian languages so that the Internet can be truly an “Enabler ” for the country to harness the digital prowess of IT. A person in his mid 90’s in age, he spoke for more than 20 minutes clearly articulating his vision for the IT Industry in India and pledged his support in this endeavor. Over 900 participants, mostly CEO’s of IT Companies, in the august presence of Sri K T Rama Rao [KTR], honorable minister for IT, Govt. 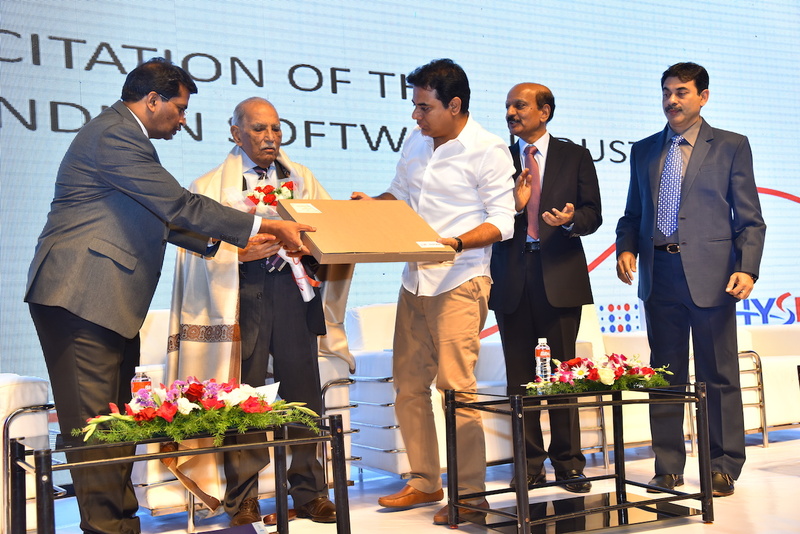 of Telangana stood up for a standing ovation to the Patriarch of the IT Industry in India and a true patriot. I dedicate this blog to Padma Bhushan Dr. F C Kohli on the Independence Day and pray to the Almighty to give him long life and health to continue to be the Beacon for the IT Industry in years to come. Born in Peshawar (Pakistan), Faqir Chand Kohli had his early education in Peshawar and Lahore. After graduating from Punjab University, Lahore he went to Queen’s University, Canada and received his B.Sc. (Hons.) in Electrical Engineering and later his MS in Electrical Engineering from MIT. After a brief stint in US training in Power System Operation Planning, he returned to India in early August 1951 and joined Tata Electric Companies. He quickly rose in ranks to become director of Director of Tata Electric Companies in 1970 and was instrumental in introducing several advanced engineering and management techniques for the operation of power systems. He was also responsible for significant use of digital computers for power system design and control, using the CDC 3600 mainframe computer at the Tata Institute of Fundamental Research. All this while he simultaneously working as consultant to Tata Consulting Engineers. In September 1969, when he moved to TCS as General Manager, it marked the beginning of IT development in our country. TCS pioneered India’s IT Revolution and helped the country to build the IT Industry. Be it the propagation of computerization in India or bringing the benefits of IT to India’s rural masses through computer based Adult Literacy programmes, Kohli saw IT as an instrument of national development. He has been working on advancing engineering education at undergraduate level to world standards to create a large pool of students ready for undertaking graduate studies and research. F C Kohli is a fellow of IEEE USA, IET UK, Institution of Engineers India, Computer Society of India and many others. He has received multiple Doctorates in Engineering (Honoris Causa) from the University of Waterloo (Canada), Robert Gordon University in Aberdeen, U.K., University of Roorkee (UP), from IIT Bombay, Jadhavpur University, Kolkata and IIT Kanpur. He has received many awards including the prestigious Dadabhai Naoroji Memorial Award in 2001, and was conferred the Padma Bhushan in the year 2002. A visionary and pioneer by nature, Dr. F. C. Kohli is acknowledged as the ‘Father of the Indian Software Industry’.